The 1980 election shocked the Democratic Party, as the Republicans won the White House and control of the U.S. Senate. 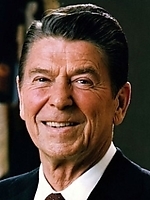 Reagan had enough support to push a series of key bills through Congress in 1981 and 1982. 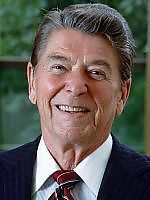 During 1982, the U.S. economy slowed, raising questions as to the viability of Reagan's economic proposals. The Democrats rebounded in the 1982 midterm elections, especially in the U.S. House, but lost a net of one seat in the U.S. Senate. Eight "major" contenders emerged for the Democratic nomination. 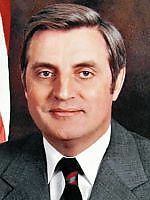 The early leader was former VP Walter Mondale, who quickly snapped up the support of labor organizations. 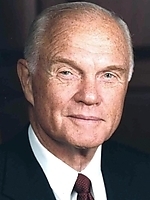 Mondale's chief rival at first was Sen. John Glenn, who ran as a more moderate Democrat. 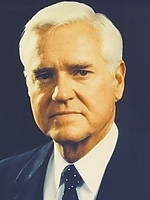 Other conservative Democrats were Sen. Hollings and former Florida Gov. Askew; the latter emphasized opposition to abortion. Two candidates ran as more liberal alternatives to Mondale: Sens. McGovern and Cranston, both highlighting the movement to initiate a freeze on the construction of nuclear weapons. 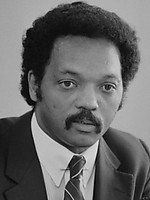 The two last "major" contenders were civil rights leader Jesse Jackson, the first black contender to mount a national campaign since Shirley Chisholm, and Sen. Gary Hart, who designed a campaign to broaden the base of the party. A 10/23/1983 Gallop poll showed Mondale leading the pack with 34% to 23% for Glenn, 8% for Jackson, and 7% for McGovern. The first major event in the Democratic campaign was a three-hour debate at Dartmouth College on 1/15/1984. Mondale drew the fire of his seven challengers. Though all candidates were perceived to have performed well, the debate produced some winners. Mondale held his own against Glenn by tying Glenn to Reagan on many key votes in the Senate. The media hurt Glenn by continually running a two-second clip in which Glenn stood and pointed at Mondale without saying anything. Other "winners" were Hart and Jackson, who established their campaigns as the most serious of the "second tier." An ABC News poll after the debate showed that Mondale had moved to a 45-22 lead over Glenn. The first official vote was the Iowa Caucus on 2/20/1984. It provided the first surprises of the campaign and set the tone for the following weeks. The first of two important events before Iowa voted was a series of spats over campaign finance. Glenn was becoming financially strapped, since he was trying to establish campaign headquarters in every state. Glenn opened a one million dollar line of credit on 2/5/1984 to pay for television ads in Iowa and New Hampshire, which underscored his inability to raise funds [NYT 2/6/1984]. By contrast, Mondale was overspending in Iowa. The FEC had established a limit of $684,537.60 for each candidate in Iowa, but by 2/11/1984, analysts estimated that Mondale had surpassed $1,000,000 [NYT 2/11/1984]. The Des Moines Register sponsored a debate on 2/11/1984, just nine days before the caucuses. Later media reports mostly emphasized Askew's charge that Mondale had been a lobbyist for a pipeline company; the charge injured Mondale but did not help the pro-life Askew. Glenn proclaimed himself to be the candidate most likely to defeat Reagan. The clear winner of the debate was Hart, who kept returning to his claim to represent a new generation of leadership for Democrats. [NYT 2/12/1984] The Des Moines Register reported that Mondale was holding his 45-21% lead over Glenn and that three candidates in the second tier were moving up against Glenn. Iowa Democrats handed Mondale 49% of the vote. Sen. Hart placed second with 17%, which he declared a "breakthrough" in his speech to supporters. Glenn's support almost vanished - he received just less than 4%. 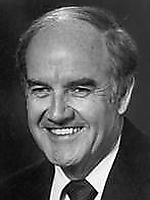 McGovern's third-place finish was mostly ignored by the press, who described the campaign as a three-candidate race (Mondale-Glenn-Hart). New Hampshire Democrats voted one week after the Iowa caucus. 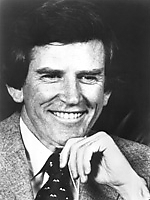 With Gary Hart's second place finish in Iowa, he immediately became the prime alternate to Mondale. A Boston Globe poll just before the Iowa vote showed Mondale leading in New Hampshire with 36% to 16% for Glenn and 13% for Hart [NYT 2/22/1984]. Hart set aside a day during the critical one week window to re-assess his campaign. At that point, his campaign was $300,000 in debt, and Hart was considering how to mount a serious challenge without increasing his indebtedness [NYT 2/23/1984]. His advisors recommended that he follow Glenn's strategy of reaching out to independent voters [NYT 2/26/1984]. While Mondale's campaign emphasized calling Democrats by phone, Glenn's campaign clogged the airwaves with television commercials. Glenn's campaign was dogged by a movement encouraging moderate Democrats to write in President Reagan's name. In the final weekend, Mondale's pollsters told him that his support was solid but not gaining, so he left the state to campaign in nearby Maine and Vermont. Hart appeared on Face the Nation and predicted that he would place second in New Hampshire, while Glenn (who also appeared on the show) was tentative about his chances [NYT 2/27/1984]. A weekend poll showed that Mondale's lead had dwindled but was still substantial: he had 38% to 22% for Hart, 15% for Glenn, 7% for Jackson, and 6% for McGovern [NYT 2/28/1984]. The New Hampshire primary on 2/28/1984 was a runaway victory by Hart. He won 37% to 28% for Mondale and 12% for Glenn. President Reagan won 5% of the vote on write-ins, receiving more votes than Hollings, Cranston, or Askew. Exit polls showed that Hart received twice as many independent votes as Mondale and split Democratic voters 37-34%. Forty percent of Hart's vote came from voters who wanted "new ideas" in the campaign. Hart's victory speech proclaimed a new two-man race, while Mondale pointed out in his concession speech that Hart still had major funding problems and had only filed partial delegate slates in many upcoming primary states [NYT 2/29/1984]. Sen. Cranston, the first Democrat to enter the race, was also the first to withdraw, on 2/29/1984 [NYT 3/1/1984]. Askew and Hollings followed suit the next day, leaving only five contenders in the field. One week after the New Hampshire primary, Hart won the Maine caucus and the Vermont "beauty contest" (3/6/1984). Hart won Vermont by a whopping 70% to 20% for Mondale. Vermont would not be the last of Hart's victories not assisting his delegate count. Altogether, 511 delegates were at stake on 1984's Super Tuesday. Five states held primaries: Alabama, Florida, and Georgia, Massachusetts and Rhode Island. Caucuses were held in Hawaii, Nevada, Oklahoma, Washington State, American Samoa, and Democrats Abroad. Mondale, Hart, Jackson, and Glenn vied for the three southern states; Mondale, Hart, and McGovern contested Massachusetts, and Rhode Island was almost strictly a Hart vs. Mondale race. Two days before Super Tuesday, the most important debate of the primary campaign took place in Atlanta (3/11/1984). The debate took place the day after Hart's 61-36% win in the Wyoming caucus. This was the debate in which Mondale referred to a Wendy's television commercial when describing Hart's proposals: "When I hear your 'new' ideas, I'm reminded of that ad: 'Where's the beef'?" This was the same debate in which McGovern achieved his "elder statesman" posture within the Democratic Party. Super Tuesday narrowed the field to two viable candidates - Mondale and Hart. Hart won three primaries (MA, RI, and FL) and three caucuses (NV, OK, and WA). Mondale won two primaries (AL and GA) and the Hawaii caucus. Overall, Hart won 34% of the three million votes to 31% for Mondale, 14% for Jackson, 13% for Glenn, and 6% for McGovern. The delegate distribution favored Mondale because Hart did not have full delegate slates: Mondale 175, Hart 168, and 100 for the others. 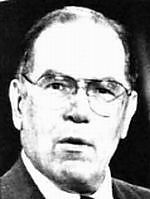 Glenn and McGovern dropped out, but soon Lyndon LaRouche entered in the first of his six quixotic efforts to gain the Democratic nomination. The delegate count after Super Tuesday stood Mondale 333, Hart 212, Uncommitted 148, Jackson 37, Others 51 [NYT 3/15/1984]. Seven states voted in the week following Super Tuesday. Mondale won Arkansas, Michigan, and Puerto Rico. Uncommitted won Kentucky, Mississippi, South Carolina, and the Canal Zone. Note: the second-place winners in some caucuses are often listed as the winner instead of Uncommitted. The Illinois primary on 3/20/1984 made it clear that Hart would not likely be able to defeat Mondale. 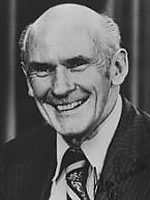 To combat his earlier inability to file complete delegate slates, Hart embarked upon an innovative campaign to instruct voters to elect national convention delegates formerly pledged to Cranston, Hollings, and Glenn. However, Hart was hurt by a poorly edited television commercial in which he stared at the voters for three seconds without talking and by a poor debate performance two days before the primary. Mondale won Illinois with 40% to 35% for Hart and 21% for Jackson. Mondale's lead in delegates was now 640 to 358 for Hart, 72 for Jackson, and 306 for Uncommitted/Others (1,966 needed for a majority). Throughout the remainder of the primary season, Mondale led by roughly 2:1 in terms of delegates. Mondale continued to do well in the spring primaries in the following month. He won the major states of NY and PA with 45% in each. Hart won CT and WI, and Jackson won DC. These states cast over 4 million votes, of which Mondale won 43% to 33% for Hart, 20% for Jackson, and 4% for others. In the meantime, Mondale won the Texas caucus with 52%, and Jackson won the Louisiana primary with 43%. The delegate count stood at Mondale 1,234; Hart 681; Jackson 236; and Uncommitted 344. With Mondale at the threshhold of victory, it is ironic that Hart surged in the latter primaries. Part of the reason for Hart's resurgance was that Mondale was reaching his spending limit for the primary season. 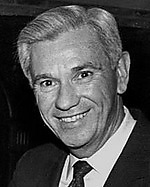 Hart won nine of the 14 final primaries, including California and Ohio. Altogether, he won a 39-38% victory in these final states; Jackson won 18% and all others 6%. Mondale passed the majority mark with his win in New Jersey on 6/5/1984, the same day that Hart won California, New Mexico, and South Dakota. Mondale had 2,065 delegates to 1,249 for Hart when the primary season was over. Name Vice President Walter F. "Fritz" Mondale Sen. Gary Hart Jesse L. Jackson Sen. John Glenn Sen. George S. McGovern Unpledged Lyndon H. LaRouche, Jr.
D Henry E. Howell, Jr.
D William V. "Bill" Alexander, Jr.
R Charles H. Keating, Jr.
D William Henry "Bill" Cosby, Jr.
D William "Bill" Clay, Sr.
D Willie L. Brown, Jr.
D William B. Spong, Jr.